Disclaimer: This is a guest post provided by Sweeney Merrigan Law LLP and Safer-America.com. I agreed to publishing it because I believe this is a great, charitable, service they are providing Boston residents. Be safe this New Year’s Eve, Boston, and take the pledge! Nothing in this world is free, unless you happen to be in Boston for New Years. Sweeney Merrigan Law is paying $5,000 to front the bill for 333 rides home this New Years in an effort to cut down on the number of drunk drivers and accidents on Boston road ways. Through their Sober Ride Home Program, the firm is offering free $15 credits for rides through the Lyft rideshare service. 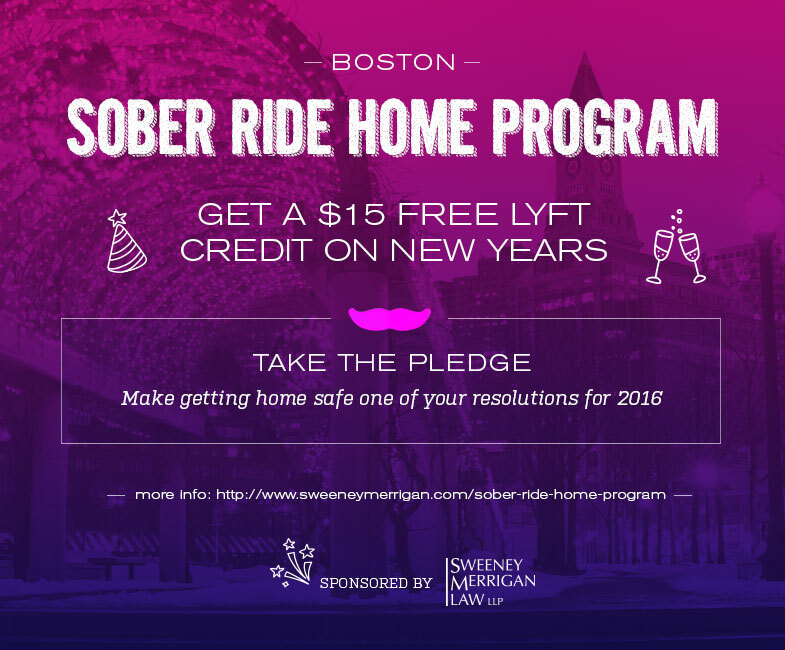 By simply visiting their Sober Ride Home Program web page and completing the quick pledge, users will be sent an individual code worth $15 that can be applied towards any ride in the greater Boston area. This should cover most rides within the city. There really couldn’t be an easier way to make $15, especially with the inevitable “primetime” pricing that comes with the holiday. And since Boston First Night/Day celebrations attract over 1 million people to the city, this is a safe and affordable way to handle transportation for the night. According to their website, the codes are set to go live on December 30th, so take the pledge against drunk driving this New Years and get rewarded with a free ride!